$600 Million in six months. $1.4 Billion in a year. Self-financing advertising creating new brand names within weeks. The IT REALLY WORKS! Story. We’ve been involved in Direct Response Television for over 20 years. 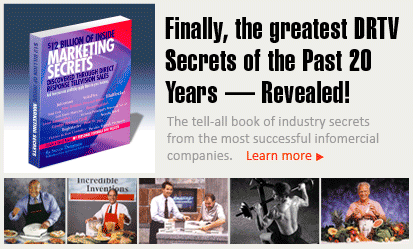 For 12 of those years we published the Infomercial Marketing Report, considered in 20 countries to be the bible of the industry, in addition to yearly supplements in Adweek and Brandweek Magazines. We’ve discovered products, like the Total Gym, which have gone on to gross over $1.2 billion dollars. In an industry in which only one out of 50 infomercials produced are profitable, every one of the infomercial we’ve produced has been wildly successful. But the truth is, we have a secret. We are not guns for hire, like most in this industry. We will not get involved with any product or service we don’t believe will make people’s lives better, more fun, or more educational. We will not take on any product in which we don’t first believe we have the breakthrough idea on how to create an irresistible infomercial that will compel people to ACT NOW. In other words, We Are Your Partner! "Steve Dworman has done for direct response television what David Ogilvy’s Confessions of an Advertising Man did for general advertising a generation ago." It Really Works! is honored to be the recipent of three prestigious Silver Telly Awards. These awards are in recognition of their outstanding work on the infomercial, The Book of Inside Information, created for Boardroom, Inc. and featuring John Cleese. Founded in 1978, the Telly Awards is the premier award honoring outstanding local, regional and cable TV commercials and programs, the finest video and film productions, including online film and video. The Telly Awards annually showcases the best work of the most respected advertising agencies, production companies, television stations, cable operators, interactive agencies, and corporate and video departments in the world. The competition receives over 13,000 entries annually from all 50 states and countries around the world. Reader's Digest, Feb 2010 · Have you noticed the shipping and handling charges tacked onto all these TV treasures? For many companies, those easily ignored fees are a gold mine. All Things Considered, Sept 27, 2004 · NPR's Michele Norris talks with Steve Dworman, publisher of the Infomercial Marketing Report, about the 20th anniversary of the infomercial being celebrated in Las Vegas at the Electronic Retailing Assn. conference. on the MEDIA, Jan 2, 2004 · "Then you also had Tony Robbins with Personal Power, which was a real breakthrough infomercial as far as documentary style..."